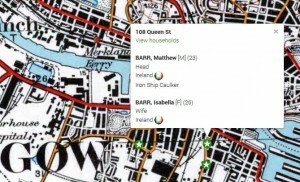 Our recently-launched interactive map is based on the 1881 census data, and offers facilities to search Govan’s immigrant population of the day by surname or birth nationality. Each census record refers to an individual person living at a given address at the time of the census, with records grouped into households. These data, however, presented a number of technical challenges as we worked to plot them on a modern Google Map. First, the geography of the parish of Govan has changed quite significantly over the years. While it might be unfair to suggest that Glasgow enjoys a propensity for tearing down its past, it is undeniable that large portions of the parish – which includes the entirely redeveloped Gorbals area in the south east of the city – has seen significant regeneration in the period since the 1881 census. So, the modern Google Map doesn’t entirely resemble the geography to which the data refers. A straightforward part of the solution was to use the National Library of Scotland’s excellent Historic Maps API*, which allowed us to layer a slightly more contemporaneous map (from the early twentieth century) over the jarringly modern Google version. This gives a more authentic flavour to the presentation, but does not address the altogether trickier issue of street names that have changed over the years. The process of geocoding refers to converting a street address, such as those recorded in the census, into geographic coordinates, such a latitude and longitude, which may be plotted on a map. For this process to work, the Google Geocoding API, the service we used to generate our latitude and longitude values, must recognise the address. For those streets that had been renamed since 1881, then, our research team had to generate a sort of gazetteer that linked the original 1881 street names with their modern, Google-friendly equivalents. With this conversion done, we were ready to begin the process of geocoding. Now, however, we faced problems with the sheer quantity of data: our original Govan dataset comprised nearly 200,000 census records, while the Google Geocoding API imposes a daily limit of 2,500 geocoding requests. Maths might not be my strong suit, but one of those numbers is significantly greater than the other. The solution was to first rationalise the data and geocode only unique addresses, since each address might refer to a six apartment tenement building with each apartment housing families of various sizes and compositions. Then, we had to be patient. A script was written to go off and geocode around 2,500 addresses at a time, and the script run each day until all of our address records possessed latitude and longitude values. * An application programming interface (API) is a means by which a software-based service such as Google Maps may be access by other website and applications. There has been much hand wringing, particularly in sections of the tabloid press, about the rise in the number of single-parent families over the past half century. This has been variously attributed to a decline in moral standards, the introduction of permissive reforms during the 1960s, the rise of consumer society, or the supposed devaluation of marriage as a bedrock of Western society. However, just how accurate are concerns that the once solid and steadying influence of the nuclear family has been diminishing in modern times? Part of our research project involves examining census records for families living in our chosen parishes throughout the period 1861 to 1911. This analysis will offer us an accurate picture of the complexities of family forms in Scotland during this period. However, census records offer us only part of a picture; they do not, on their own, reveal all forms of living arrangements experienced in Scotland in the past. Nor do they tell us explicitly, the immediate histories and futures of the men, women and children living in a given street at a given time. They are, in effect, a snapshot of a specific time and place. So, how do we flesh out these records? One method is to compare what is printed in the census enumerators’ books and what is held in parish records. As we are focusing on working-class families a significant number of these will have applied to the parish for support at some point in their lives, therefore, we have undertaken significant research using poor relief material, which often throws up more information about how families were constituted, and how their lives together changed over time. By using some examples from our databases we will demonstrate that census records can often hide the complexity and fluidity of families. Even in cases where there is no related parish record material we can uncover the complexities of households through careful analysis of census records. In the following example from Thistle Street, Gorbals we have a stepfamily which is relatively complex. We can deduce from the material that both William and Catherine have been married before, as the children have two surnames: Lamont and Greenfell. By accessing prior censuses we discovered that Catherine was widowed in 1870, when she was 24, and her first husband, John, was just 31. John Greenfell was a lead miner and a contributing factor in his death were diseases of the lungs (most likely silicosis), and liver (lead poisoning). Catherine remarried, this time to William Lamont, on December 31st 1876, Hogmanay being a popular date for marriage. William’s first wife Margaret, the mother of David Lamont and 3 other children, died at 37 in 1869 from Phthisis pulmonalis (Tuberculosis). 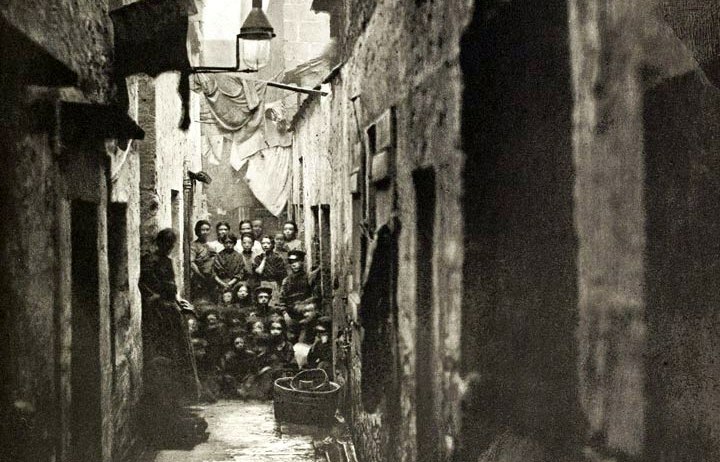 The following entry from George Street, in 1881 is an example of two families living in one flat, or of families within families. However, one can deduce from the information presented that Thomas (28) and John (26) are possibly brothers, cousins, or even uncle and nephew – the differing countries of birth, although not discounting siblingship, allows us to speculate on other connections. However, the census reports only offer us information relevant to the evening of the 3rd of April, 1881. By examining parish records for applications for poor relief we learn that John had, at some point in 1881, deserted his wife. We also learn that Catherine’s children may not be John’s. Parish records inform us that Margaret was born of a previous marriage and suggest Catherine Junior was illegitimate, and most likely was not John’s otherwise her birth would have been legitimated by their subsequent marriage. From marriage records we are fairly sure that John and Catherine were married in 1880. Stepfamilies, where the father has married a widow with children are usually easier to determine as the children, in many cases, retain the surname of their biological father, but this is not always the case, and makes identifying the number of stepfamilies, purely from the census, quite difficult. The 1881 census records for the Lindore family of Blackburn Street offer us only basic information. Tracing the family to the 1891 census we find that they have moved but otherwise little has changed. However, the parish records for Govan inform us that in 1881 Margaret had moved her daughters to a new address in Dale Street. This was because her husband was now in prison for wife beating. William had previously been a serial deserter, leaving Margaret and family to seek support from poor relief. Interestingly, in the census of 1891, William is still living at home, evidence that the options for abused wives were seriously limited during the late nineteenth century. In the following example from 1911, this household appears to comprise of a widowed father, his 4 children and a live-in housekeeper and her daughter. However, with a little digging through parish records we have discovered that this is a form of nuclear family. William and Annie are cohabiting and have 2 children together. The other children are William’s by his late wife. Social conventions of the period likely led the census enumerator to ‘invent’ a household composition as there was no category for unmarried couples living together. Of course, census records mask the true level of couples living together for this reason, and enumerators required no proof of marriage so many cohabiting couples might have indicated that they were in fact married. There were multiple reasons for working-class lone parenting, including desertion, separation, death of a spouse, a change in circumstances, financial uncertainties and the inability/unwillingness to marry. We read much these days about the how ‘modern’ life has led to an explosion in the number of single-parent families, which has often been framed within a discourse which suggests that this thoroughly modern development has had a deleterious impact upon the traditional nuclear family. In the table below we can see that single-parent families were certainly not rare in late 19th-century Scotland (today single-parent families account for around 1 in 5 households with children in Scotland). Relying solely on census information, again, often tells only part of a story. The census entry for Sarah Milligan and family suggests that she is ‘acting’ head while her husband is away at sea. Yet, by tracing her to the Govan parish records we discover that Sarah’s marriage was irregular, and according to those records both her children are illegitimate, despite irregular marriage being legally valid in Scotland. Perhaps these children were born to a previous partner. According to parish records she is listed as a lone parent. There was no category in the census for deserted wives and many would have been recorded as still married or even widowed. Thus we can see that the census seriously underestimated the extent of desertion and separation. Similarly, in the following two examples, although both female heads are listed as married in the census, their spouses are absent. In such examples the census may lead us to believe that these men are simply away, perhaps working. However, in both cases these women are separated from their husbands. In the case of Annie Houston, desertion by her husband would lead to the breakup of her family. A family requiring some detective work is the Bigley/Begley family of 40 Dale Street. According to parish records one of Bridget’s daughters had an illegitimate child who resided with the family at 40 Dale Street. It is difficult to ascertain the identity of this grandchild, or indeed whether the child was born to Sarah or Mary, as according to the census there were no grandchildren living at this address at the time. If not yet born then undoubtedly one of the daughters was with child at the time of the census enumerator’s visit. Illegitimacy may have carried a social stigma during this period but was much more common than what we have perhaps believed. For example, in 1881 illegitimacy rates fluctuated dramatically in Scottish parishes between 4% and 30% of all live births. Not all single-parent families are easy to spot within the census. The next example of the McCarthy family in Thistle Street looks like a fairly straightforward extended family with a single parent head. Yet, what we have here is a single-parent family (Mary’s son James and his daughter) within a single-parent family, headed by Mary. However, daughter Catherine was pregnant with an illegitimate child and would soon extend the household to include a single-parent family within a single-parent family living alongside another single-parent family. Our research is demonstrating that family and household composition in Scotland between 1861 and 1911 was much more complex and fluid than traditional explanations have suggested. The nuclear family may have been the most numerous within Scotland but it rarely comprised over 50% of all households in our parishes, drawn from the north, south, east and west of Scotland, including both rural and urban areas. In Govan, a significantly large and industrial Scottish parish, nuclear families (those containing parents and children) accounted for 45% of all households in 1901, and 50% in 1911. In rural Perthshire nuclear families never accounted for more than 40% of households until a small rise in 1911. Our research is also demonstrating the dynamic quality of households over time, in the manner by which they could be shaped and reshaped by economic and material conditions, and the way in which families adapted their own households in an effort to provide economic and emotional support.